Thane is a vibrant city and a major part of the Mumbai Metropolitan Region (MMR) that has come a long way over the past couple of years. From dawn to dusk, Thane has a lot to offer its residents. In fact, there is nothing to not like in this amazing city. From fabulous social and physical infrastructure to top-notch civic amenities, wide and clean roads, open green spaces and low air-pollution when compared to other cities in the Mumbai Metropolitan Region (MMR), Thane offers a life that is filled with fun and entertainment. The real estate market in Thane has doubled in terms of residential as well as commercial projects in different parts of the city and its outskirts. As property demand in Thane is on a constant rise, competition between real estate companies has grown to a whole new level. While the residential options in Thane are many today, selecting the right development is very important in order to gain good returns in the years to come. An investment that brings back good value is an investment well planned. 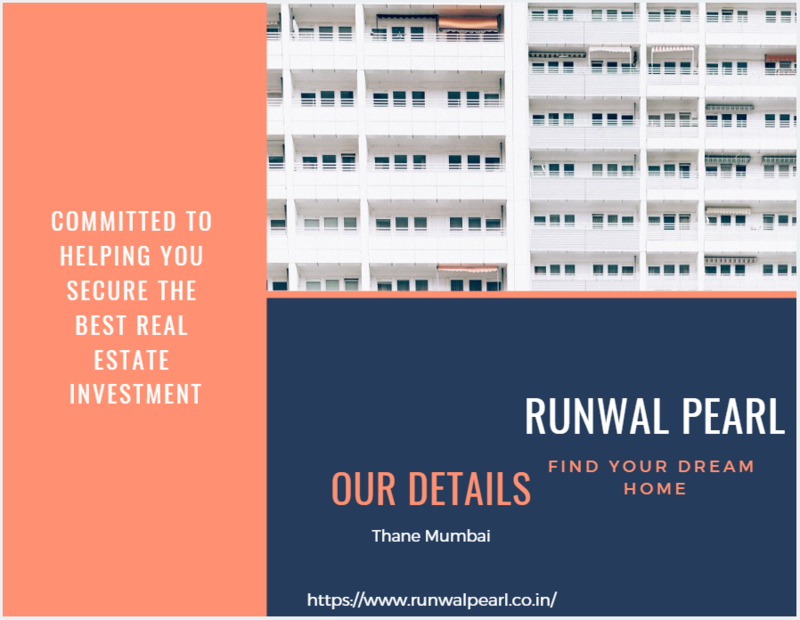 Amongst the options, Runwal Pearl is a high-rise residential project in Thane by Runwal Group that you should definitely consider when looking out for a home or investment in Thane City. Due to the popularity of this high-rise residential project, only the last 2 towers are up for grabs. Spread over 6 acres of luscious greens, this high-rise development contains extravagant towers of 30 floors that offer beautiful variants of 2BHK and 3BHK luxury apartments that are designed to comfort. The apartment carpet area sizes start at 584 sq. ft. and move up to 738 sq. ft.
Runwal Pearl Thane is an outstanding high-rise residential development that is home to more than 400 families today. Every element of this development is packed with luxury and comfort of the highest level. The apartments contain premium fittings, high-quality flooring, large doors and windows providing views of Yeoor Hills and lush greens, kitchens with granite tops, hi-tech safety features and more. This high-rise development does not fall short of external amenities and offers only the best. They include a clubhouse, jogging track, swimming pool, meditation centre, sports facilities, a dedicated play area for kids, gymnasium, party hall, pergola, landscape garden, wide open space, and high-end security. Situated at Ghodbunder Road, a popular location in Thane, this residential development is surrounded by a number of landmarks and offers a life of convenience that is pretty impressive! From reputed schools and colleges to malls, shopping centres, hospitals, pharmacies, cafes, clubs, lounges, pubs, restaurants, water parks, entertainment zones, banks, ATMs, retail outlets, automobile showrooms, convenience stores and more, no place is hard to find when residing at this high-rise development. Starting at an excellent price of Rs.93 lakhs and moving up to Rs.1.22 Cr., the apartments at this residential development is cost-effective and cater to the requirement of buyers from different income segments. May it be a new home or an investment for that matter, a residential space at Runwal Pearl Mumbai is definitely worth a buy. There are different payment plans to choose from along with home loan facilities at low-interest rates, NRI services and more. Without a doubt, a new age of luxury starts and ends here!